Our ‘High Five’, which illustrates the Christian core values of our ethos, was established in January 2013 following consultation with all stakeholders. The worship council collated the favourite values and our final top five are shown in the hand! 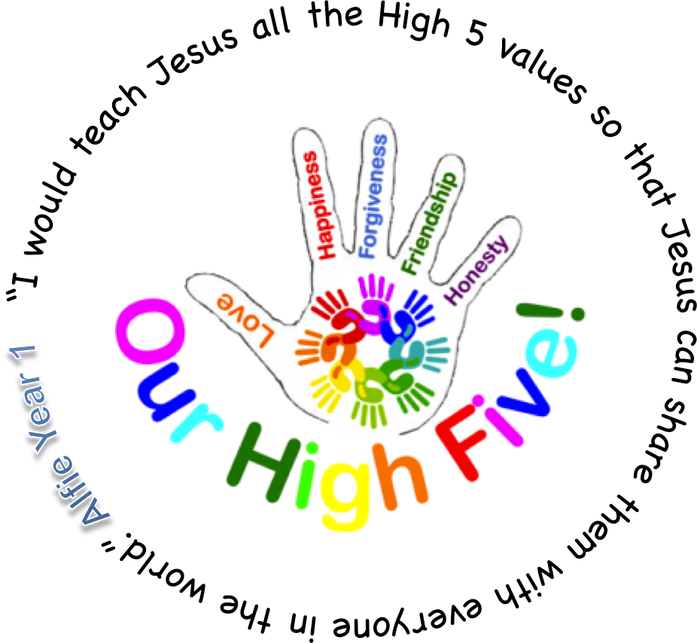 The ‘High Five’ allows us to promote and celebrate our values in a positive way – we seek to see our ‘values in action’! Year on year, we celebrate the High 5 Birthday and reflect on each of the values through creative curriculum days. "...the school's Christian character underpins all that the school does and is central to it's success. Staff and Governors ensure the school's 'High Five' values of love, happiness, forgiveness, friendship and honesty are embedded in everything that pupils hear, see, experience and do." SIAMS 'outstanding' report November 2015. Our Mission Statement has our High Five values at its heart.